Hi, all. Meredith, chiming in. Charlotte and I have been best friends for forever. How long? Oh, I don't know, maybe kindergarten. Except I remember playing in a playpen with her, so probably before kindergarten. But our first memories are when we have pictures in kindergarten. Both of us in tutus. Pink with sparkles. Talk about looking silly! I have such great memories of times spent with Charlotte. Chatting in my bedroom, listening to music, painting our toenails. Oh, and get this. She was always chasing the boys. When she was seven, she had this one guy she liked a lot, Jimmy, and she chased him behind a tree and kissed him every day for a month. Okay, I did the same thing with Davey. We were both boy crazy. At one point, she liked my older brother, Freddy. He's so cute. He was a gymnast in school. Really active and coordinated. Not like me. I could dance and run, but I didn't have any coordination otherwise. I was into books. Books, books, books, that's me. I'm a teacher now. In fact, I was the teacher for Charlotte's nieces last year. They're not really her nieces. They're her cousin's children, but she calls them nieces. It's a long story. I'm madly in love with their father, Matthew. Another long story. Anyway, I'm so excited. I'm trying to get the funding to change a long-abandoned winery in Providence into a liberal arts college. We could really use higher education. Many of our high school students don't want to leave the area. And there are many more in Ohio who would really like to live in Providence. It's such a charming little town. There are artists and musicians and, well, so many who would love to live here. At the beginning, Charlotte was really excited about having a fund-raiser, but then she thought a little more about where I want to throw the party--at the winery, of course--and she got cold feet. Yes, the winery has a little history. Okay, a lot of history. A pretty weird family lived there. The man who owned the place was a cold unfeeling man. His wife was possibly a little cuckoo. Their son...need I go on? Charlotte's freaked out and I'd really like her to calm down. The family is gone. The history is past. The place is empty and ready for an overhaul. I'm thinking a fondue party would be perfect. What do you think? What can I say to convince her it's going to be just fine? I'm inviting art students to commemorate the event. Isn't that perfect? One of them is my talented niece, Quinn. Perfect, right? Oh, P.S., my author wanted to say a few words because LOST AND FONDUE is coming out in a few weeks. I'm running a month-long "launch" contest. The rules are on the home page of my website: Avery Aames. Follow the instructions and you could win a fondue pot or bookstore certificates. Check it out! Also, a SNEAK PREVIEW and BOOK TRAILER of LOST AND FONDUE are up on the website. 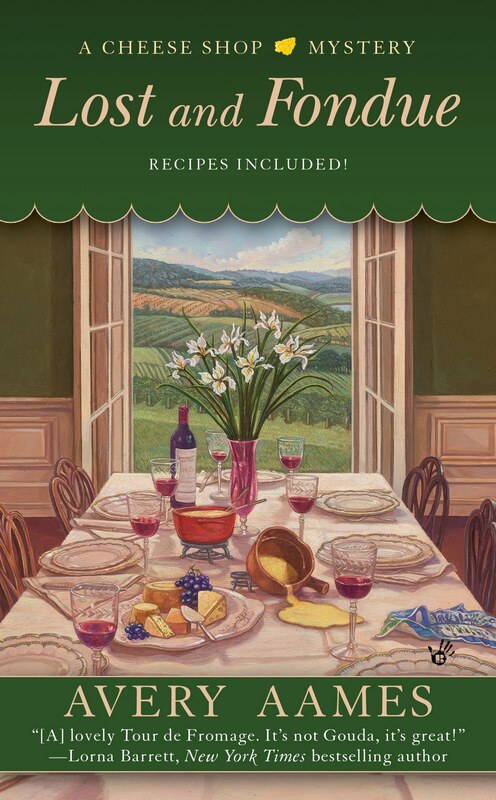 If you'd like to know more about A Cheese Shop Mystery series and want to download a few other recipes from me (on recipe cards), click on the above link, as well. I've posted recipes in the "morsels" section. And sign up for the mailing list to get my quarterly newsletters. I don't know, Meredith. That winery sounds creepy. Maybe you should listen to Charlotte. But Janet, if I do, where would the fun be in that? I mean, Charlotte isn't always right. Okay, most of the time she is, but not always. And it just seems so romantic. At the top of the hill, with a view of Providence below. Just think how fabulous that place will be for students. How inspiring! I think the winery sounds ideal except you might want to have it exorcised or something first. Just in case... Sounds like a great cause. Can't wait to read all about it. Now, if you plan on making it into a school, what's wrong with a little fondue fundraiser there?? Hmm??? See if you can make it fun. I'll leave that up to your imagination. I love the idea of a liberal arts college in an old winery. But it should be a liberal arts college with a twist to distinguish it from stuffy places like Swarthmore and Amherst. Instead of all those boring old books they make you read in the liberal arts, throw a few mysteries into the required reading list. Maybe the students could take a course in solving murder mysteries and discover what really happened to the family that used to live there. Oh, Mike, what a great course to offer at the school. A little "murder mystery" forensics. Wish I'd thought of it. May I borrow that idea? We'll be having meetings to prepare for the list of courses offered once we get this off the ground. Art will be involved. It's so lovely in Providence. I think Renoir and Monet would have had a fabulous time painting the view. And Dru, we'll definitely make it a fun party. I'm thinking mariachis and races and lots of color! Ooops, Avery is a little sneak. She posted her name and it was supposed to be mine. Sheesh. As for convincing her, try bribing. You must have some other embarrassing pictures around. Oooh, Heather, embarrassing pictures? I do, I do. For Halloween one year, she wanted to be a harem girl. She sewed together a bunch of Grandmere's scarves and put on lots of makeup. And the next day Grandmere was asking about the scarves and Charlotte made me swear I would never tell. But then she told, because she just can't lie to her grandmother, but I still have the picture. I bet she wouldn't want that picture to show up on the Internet. Could I? Would I? I hope I don't have to resort to "blackkmail." Tee-hee. Your plans sound great, but I do understand Charlotte's reluctance. I am sure you'll find a way to bring her around. I wouldn't mind attending this bash myself - especially as the new book is out in a couple of weeks! Mary Jane, you're all invited. Charlotte's making fondue and cheese platters, and well, the food will be great. and the view. Did I mention the view? We could use all the support in the world. I'm just so excited about opening the eyes of our youth. We have so many students who would like to stay around Providence after graduating from high school. We owe it to them, don't you think? Our community could use their enthusiasm. We can't let our youth or education flounder, right?